The rest of the season of Vampire Diaries is going to be pretty action packed; there’ll be answers, and god, does it show that I really can just -not- wait for the show to start again? My god, will Thursday ever come?! One blogger brought up a really good question though, and the producers actually responded. 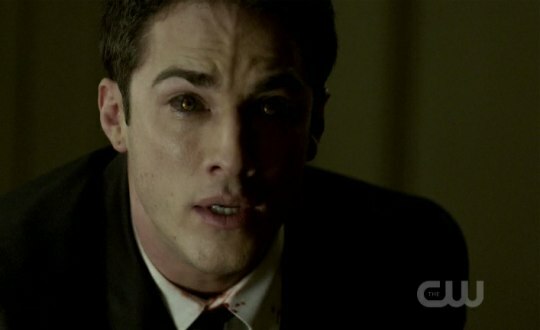 But, I’m rambling, the question is: After Tyler had such a painful first transformation, the horror, and the pain, –what if he decides to sacrifice Elena for the sake of breaking the curse for the werewolves? I see, said the blind man. Is that where the storyline is heading? Imagine if the werewolves began fighting with the vampires for the chance to break the curse: if the werewolves break it, their curse ends, but the vampires stay in the dark. If the vampires break it, they can come out, but the werewolves are still screwed. Mandi from Popwatch has the scoop and, viewers be warned, BEWARE OF SPOILERS! Well, allow me to answer: Tyler can always be counted upon to do the wrong thing. Always. How will the confrontation for Tyler turn out? Bad. And will he actually try to break the curse, even if he has to sacrifice Elena? Most likely. He may not do it in a rude way, per se, like, intentionally screw with her or try to kill her, and he’ll probably be influenced, or used, because, even as a hot werewolf, Tyler is a tool.